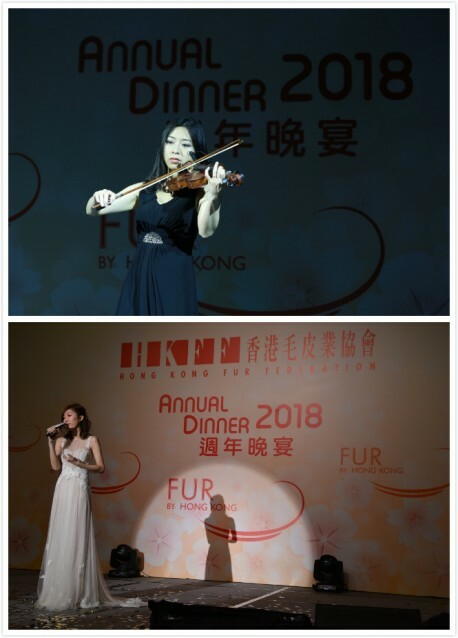 The Hong Kong Fur Federation’s Annual Dinner 2018 was held on 25 March at the Convention Hall of the Hong Kong Convention & Exhibition Centre. 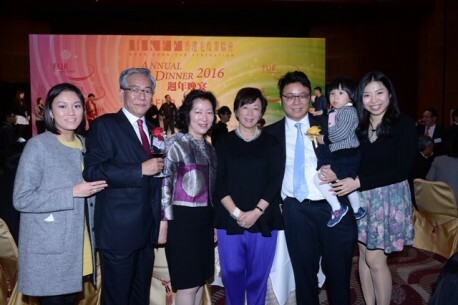 The event was attended by near 1,000 guests, including colleagues and families of member companies. It was with great honor that the Federation had invited Mr. Zhou Yi, the Deputy Director of EAD, Liaison Office of the Central People’s Government in the Hong Kong S.A.R. 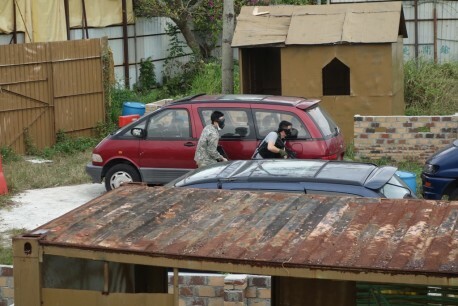 to attend the event. In addition, the Hon. 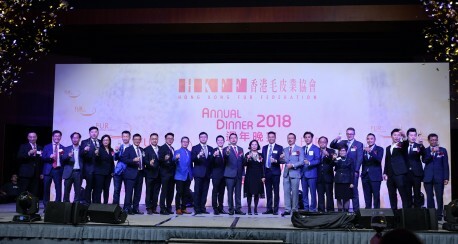 Peter Shiu, Vice Party Chair of Liberal Party as well as representatives from Hong Kong’s major trade associations also joined the event, they included: Prof. Daniel Cheng, Honorary President of the Federation of Hong Kong Industries (FHKI), the Hon. Jimmy Ng Wing Ka, JP, Legislative Council Representative of the Chinese Manufacturers' Association of Hong Kong (CMA), Mr. Frank Leung Yat Cheong, Chairman of the Federation of Hong Kong Footwear Ltd., Mr. Steven Au, Vice-President of the Federation of Hong Kong Footwear Ltd. and Ms. Betty Au, Director of the Hong Kong Apparel Society Ltd.
Mr. Wilson Chiu, the Chairman of the Federation, presented his annual report and mentioned a number of major issues the Federation dealt with last year. 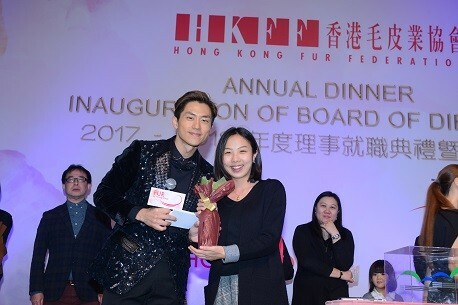 He also congratulated the winner of Fur Design Competition entered the final of Remix International Fur Design Competition; and the recent Fur Fair recorded unexpected successful result. 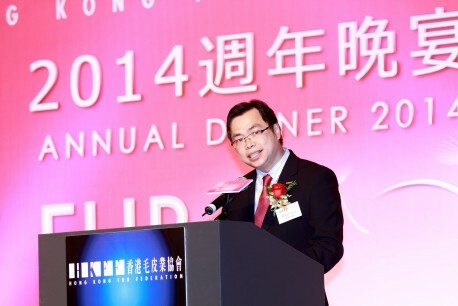 Moreover, Mr. Chiu thanked members, Directors and our associates for their long-term support. 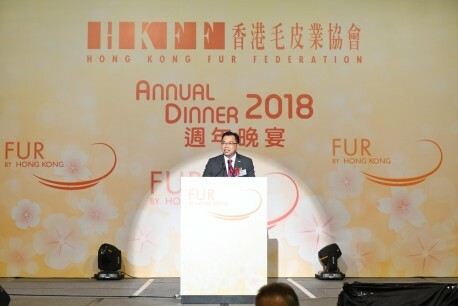 He encouraged members to develop more innovative fur products and looked forward to working closely for the betterment of the Hong Kong fur industry and promoting “Fur by Hong Kong” to reinforce Hong Kong as the world’s No.1 Fur Trade Center. 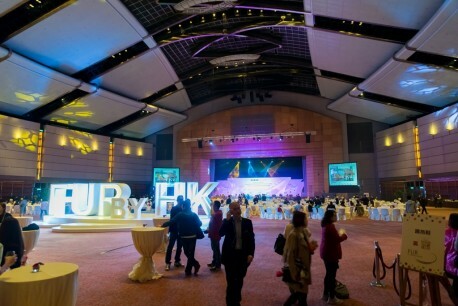 The Annual Dinner has always been one of the most popular activities among members and it has become the best networking platform for the industry. During the occasion, the Federation presented a souvenir to each of the Young Executive Committee (YEC) members who served the Committee for over 2 years in appreciation of their devoted service and contribution to the Federation. The Federation is always keen to promote environmental consciousness and contribute to the needy in society thus the unconsumed food of the event was collected and donated to “Food Angel” to share with the less privileged people. 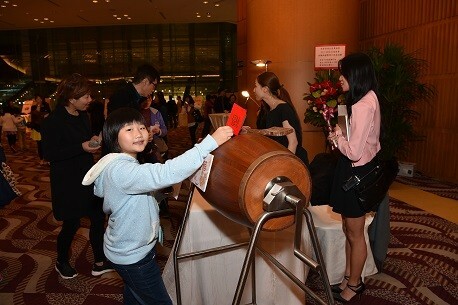 In addition, at the cocktail reception, game booths such as “It’s Fun to Recycle” and fortune telling etc were set up to entertain the guests of all ages. Following the cocktails, a violinist performance accompanying with signer Ms. 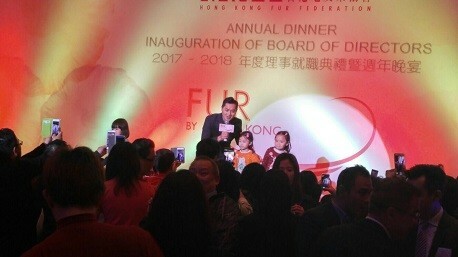 Ally Tse unveiled the opening for the dinner. 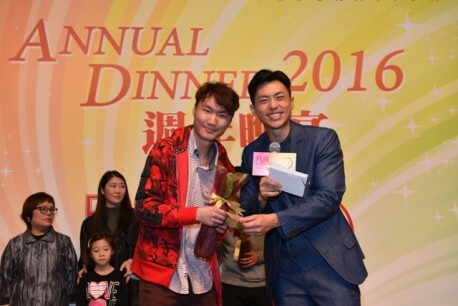 This year, the organizer once again invited Mr. Sammy Leung, a popular artist and TV/radio anchor to be the MC of the event. He is brilliant in interacting with audience and hosting games too thus bringing a lot of joy to the event. Another singer Ms. Kayee Tam was invited to perform 2 songs at the event. 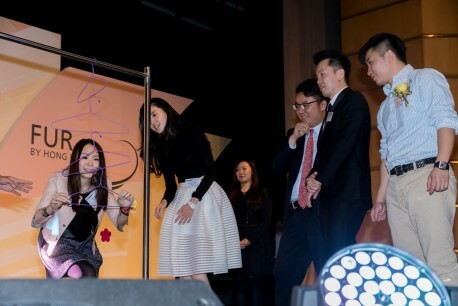 After her performance, she also played an interactive game with audiences on stage. 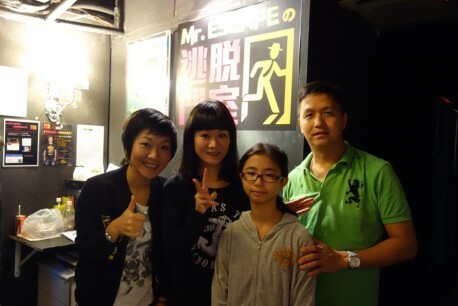 The best always comes last, apart from Kayee, the Federation was delighted to invite Ms. Jinny Ng, a pop singer to be the performing guest of the finale. 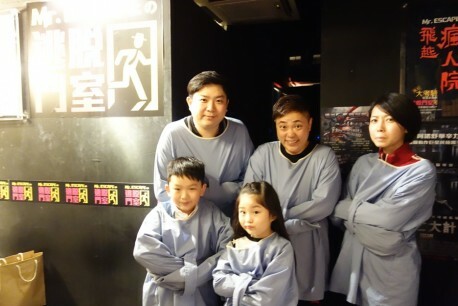 While kids and fans approached to the stage during her performance, Jinny passionately joined them for a picture. 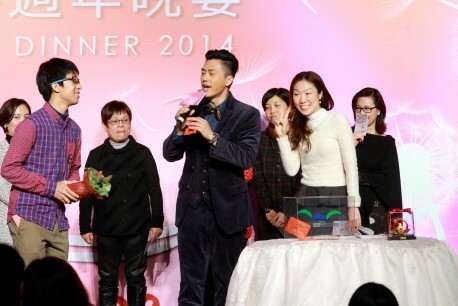 When playing game with kids on stage, Jinny passed on lucky money to the little winners. 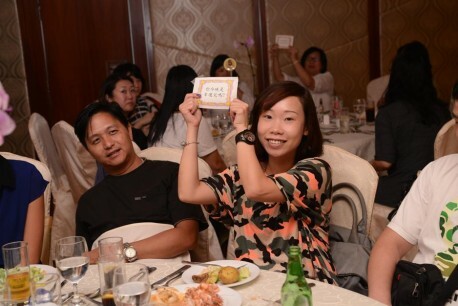 The Annual Dinner would not end without lucky draws, plenty of cash prizes were given out during the event. After dinner, many guests waited for taking a selfie with Sammy. The organizer had uploaded the joyful moments of the event in the Fur Fun Fun Facebook fanpage. Everyone had a wonderful evening! 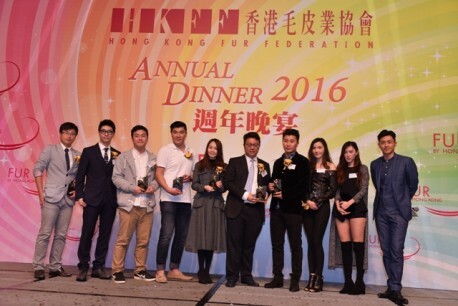 The Hong Kong Fur Federation’s Annual Dinner 2017 was held on 25 March at the Convention Hall of the Hong Kong Convention & Exhibition Centre. 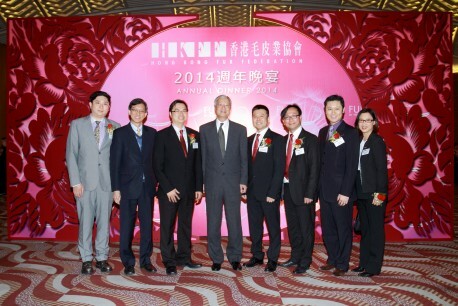 The event was attended by near 1,000 guests, including colleagues and families of member companies. It was with great honor that the Federation had invited Legislative Councilors and representatives from Hong Kong’s major trade associations to join the event, included the Hon. 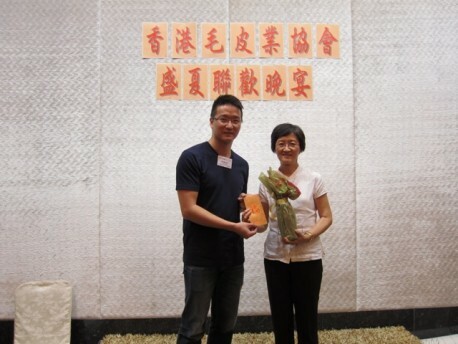 Mrs. Regina Ip, GBS, JP, Legislative Councilor and Chair of New People’s Party, Legislative Councilors the Hon. 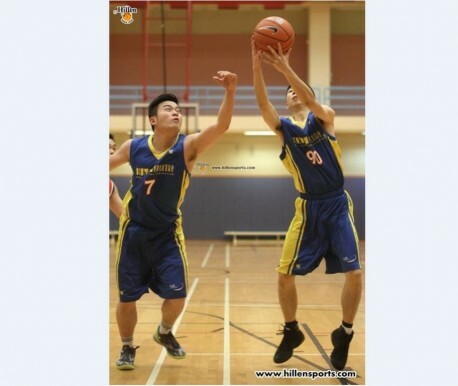 Felix Chung and the Hon. Peter Shiu , as well as Dr. Eddy Li, President of Chinese Manufacturers' Association of Hong Kong, Prof. Daniel Cheng, Chairman of Federation of Hong Kong Industries, Mr. Banny Yu, Chairman of Hong Kong Apparel Society Ltd., Mr. Homer Yu , MH, Chairman of The Professional Validation Centre of Hong Kong Business Sector, Mr. Frank Leung, President of The Federation of Hong Kong Footwear Ltd. and Ms. Kelly Xu, CEO of Asia Region of International Fur Federation. 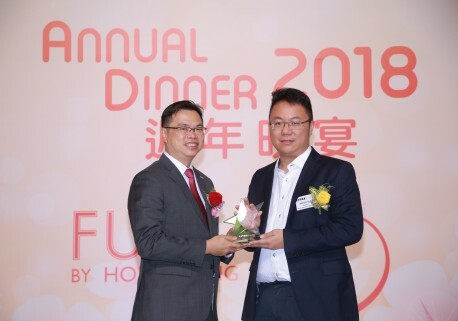 Mr. Henry Sun, the Chairman of the Federation, presented a speech and thanked the Board members who have worked so closely with him in the past two years. 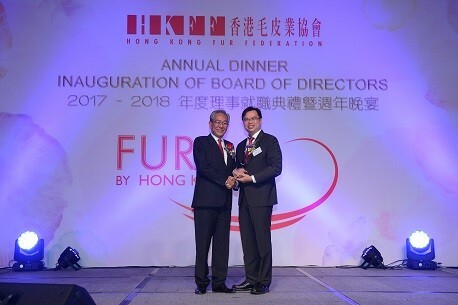 He was proud of serving the Board for over 30 years and being the Chairman for 2 times and grateful for the long-term support from numerous organizations, which included the Chinese Manufacturers' Association of Hong Kong, the Federation of Hong Kong Industries, the Hong Kong Trade Development Council, the Hong Kong Trade and Industry Department and the Hong Kong Productivity Council. 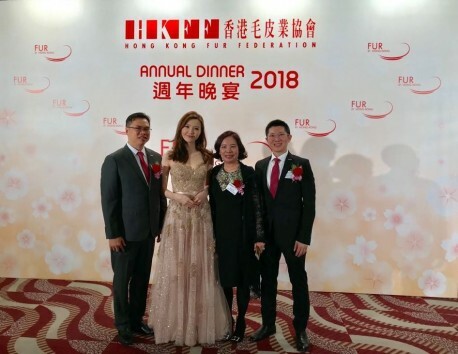 Meanwhile, he hoped that with concerted spirit of the new Chairman Mr. Wilson Chiu and two new Vice-Chairmen Ms. Rose Ko and Mr. Dennis Fong, the Hong Kong fur industry will keep reaching new heights in the years to come. The new Chairman, Mr. Wilson Chiu, who serves the Chairmanship the second time, presented a speech and encouraged members to meet new challenges and explore the untapped potential. 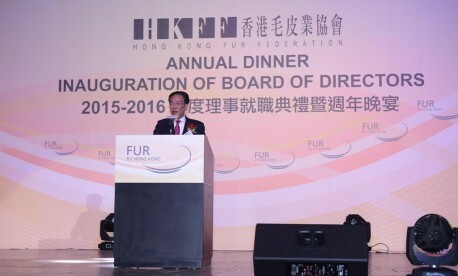 He was pride in Hong Kong furriers’ united spirit and looked forward to members’ support and making a new milestone for fur industry. Upon changing the term of the Board, the Federation took this opportunity to present a souvenir to each of the Directors who served the Board in the past 2 years in appreciation of their devoted service. 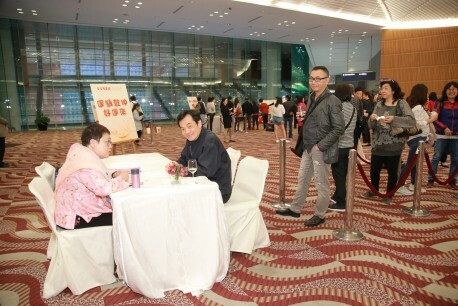 The Annual Dinner has always been one of the most popular activities among members and it has become the best networking platform for the industry. At the cocktail reception, game booths, fortune telling booth and portrait painting booth were set up to entertain the guests of all ages. 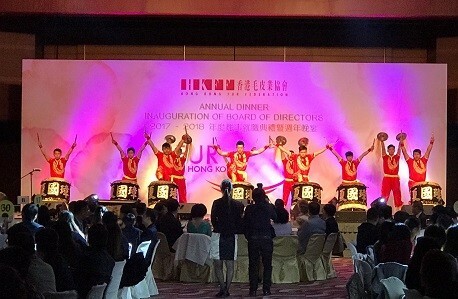 Following the cocktails, a group of drummers presented a drum performance to bring a powerful opening for the dinner. Nevertheless, the Federation is always keen to contribute to the needy in society thus the unconsumed food of the event was collected and donated to “Food Angel” to share with the less privileged people. 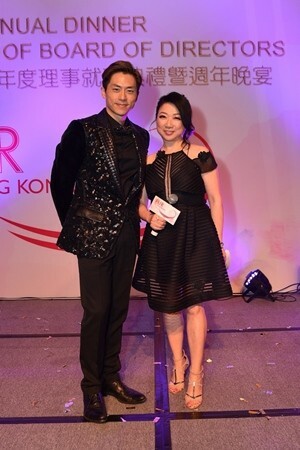 This year, the organizer once again invited Mr. Sammy Leung, a popular artist and TV/radio anchor to be the MC of the event. He is brilliant in interacting with audience and hosting games too thus bringing a lot of joy to the event. 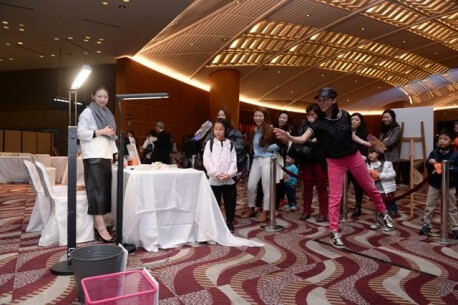 Meanwhile, singer Ms. Ava Liu was invited to perform at the event. Apart from Ava, the Federation was delighted to invite Mr. Fred Cheng, a pop singer to be the performing guest of the finale. 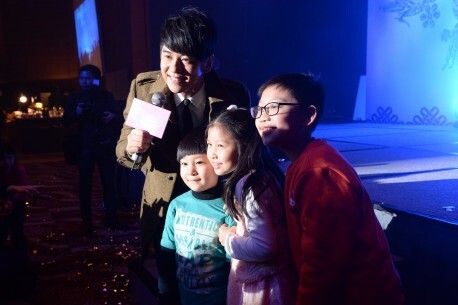 While kids and fans approached to the stage during his performance, Fred passionately came down the stage and joined them for a picture. 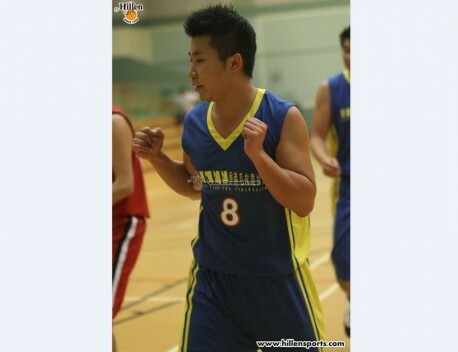 He also hosted a game with Sammy bringing joy and fun to all audiences. 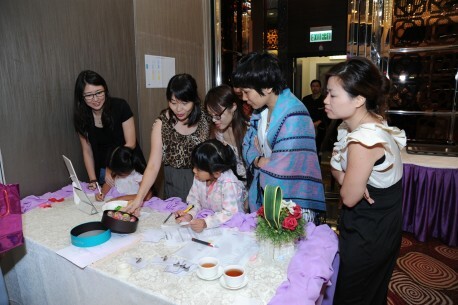 The Annual Dinner would not end without lucky draws, fabulous prizes were given out during the event. Everyone shared the joyful moments and enjoyed a wonderful gathering! 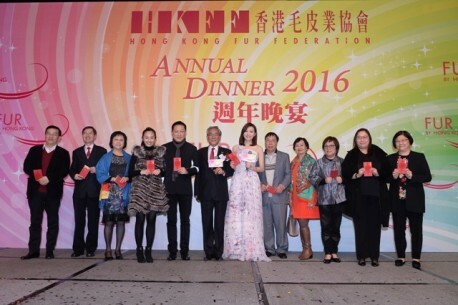 The Hong Kong Fur Federation’s Annual Dinner 2016 was held on 20 March at the Convention Hall of the Hong Kong Convention & Exhibition Centre. 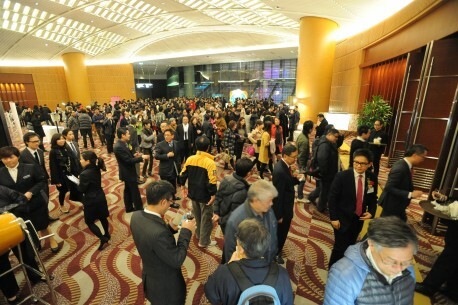 The event was attended by near 1,000 guests, including colleagues and families of member companies. It was with great honor that the Federation had invited Mr. Yang Yi, the Deputy Director-General of EAD, and Mr. Wang Gang, Director of Investment Group, Liaison Office of the Central People’s Government in the Hong Kong S.A.R, to be the guest of honor. 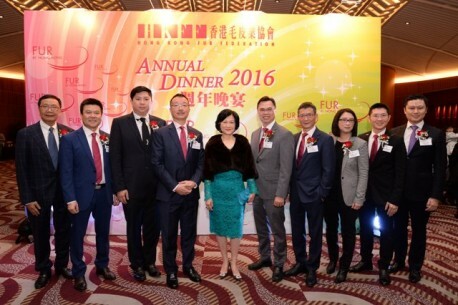 In addition, the Hon Mrs. Selina Chow, O.B.E., JP, GBS, Member of the National Committee of CPPCC, the Hon Mrs. Regina Ip, GBS, JP, Chair of New People’s Party and Mr. Peter Shiu, Vice Party Chair of Liberal Party as well as representatives from Hong Kong’s major trade associations also joined the event, they included: Mr. Jimmy Kwok, Deputy Chairman of the Federation of Hong Kong Industries (FHKI), Mr. Stephen Liang, Director of Product Promotion of the Hong Kong Trade Development Council, Mr. Banny Yu, Chairman of the Hong Kong Apparel Society Ltd, Mr. Ng Ching Wun, Vice-President of the Chinese Manufacturers' Association of Hong Kong and Mr. Wong Chun Lam, Vice-President of the Federation of Hong Kong Footwear Ltd.
Mr. Henry Sun, the Chairman of the Federation, presented his annual report and mentioned a number of major issues the Federation dealt with last year, they included reflecting the industry’s concern of the adjustment on CMT policy to related officials in the Mainland, and the Federation had successfully recruited majority of members joining the newly established Group 29 “Fur & Leather Garments” of the FHKI. 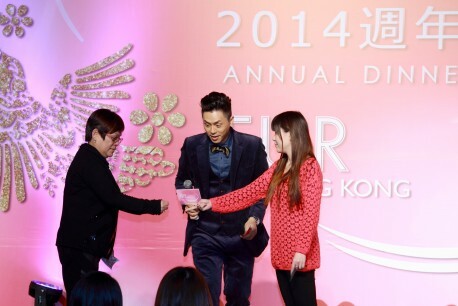 Mr. Sun also thanked members, Directors and our associates for their long-term support. 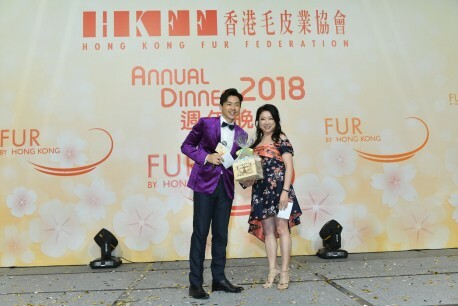 He looked forward to working closely for the betterment of the Hong Kong fur industry and promoting “Fur by Hong Kong” to reinforce Hong Kong as the world’s No.1 Fur Trade Center. In support of the upcoming District Council Election, the Federation took the opportunity to distribute the Application Form for Voter Registration and reminded members to register. Nevertheless, the Federation is always keen to contribute to the needy in society thus the unconsumed food of the event was collected and donated to “Food Angel” to share with the less privileged people. At the cocktail reception, game booths such as “It’s Fun to Recycle” and fortune telling etc were set up to entertain the guests of all ages. Following the cocktails, a team of young dancers presented a K-pop dance to bring an energetic opening for the dinner. The organizer had specially arranged a dancing group, Super Girls, to perform 3 songs at the event. The best always comes last, apart from Super Girls, the Federation was delighted to invite Ms. Jinny Ng, a pop singer to be the performing guest of the finale. 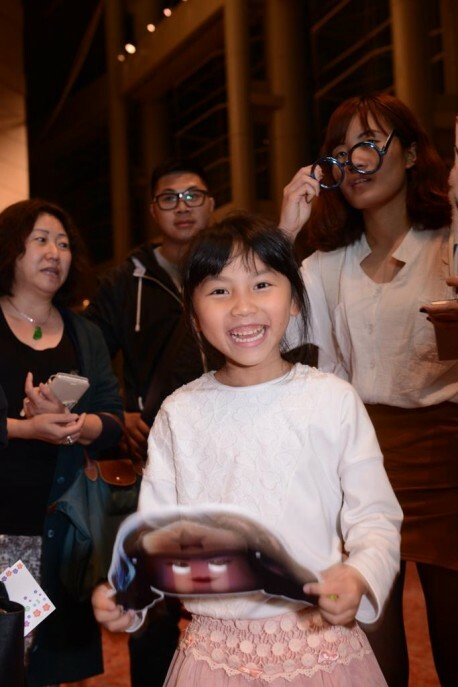 While kids and fans approached to the stage during her performance, Jinny passionately came down the stage and joined them for a picture. She also hosted a game of magic with the Chairman bringing joy and lucky money to winners. 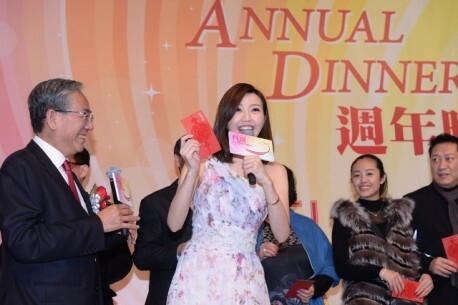 The Annual Dinner would not end without lucky draws, over HK$120,000 cash prizes were given out during the event. 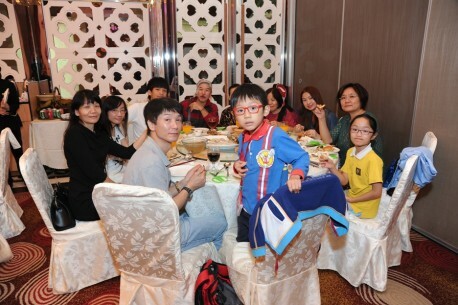 Everyone shared the joyful moments and enjoyed a wonderful gathering! 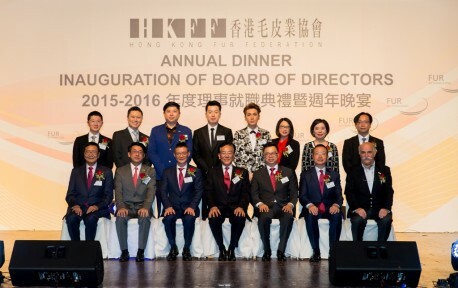 The Annual Dinner & Inauguration of Board of Directors 2015 - 2016 of the Hong Kong Fur Federation was held on 27 March at the Grand Hall of the Hong Kong Convention & Exhibition Centre. 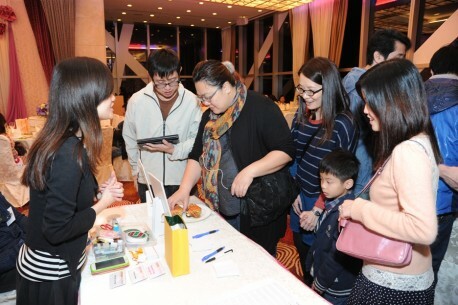 The event was attended by over 100 member companies, including their colleagues and families. It was with great honor that the Federation had invited Legislative Councilors and representatives from Hong Kong’s major trade associations to join the event, included Legislative Councilors, Hon. 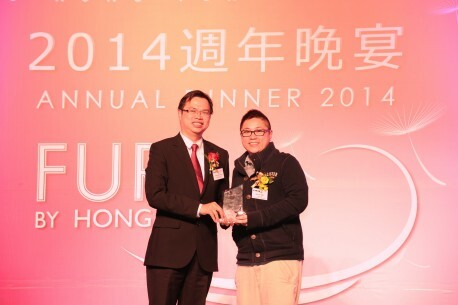 Felix Chung and Hon. Wong Ting Kwong, SBS, JP; Mr. Wang Zheng Wang, Economic Affairs Department, Liaison Office of the Central People’s Government in the Hong Kong S.A.R; Mr. Willy Lin, SBS, JP, the Deputy Chairman of Federation of Hong Kong Industries and Mr. Banny Yu, the Chairman of Hong Kong Apparel Society. 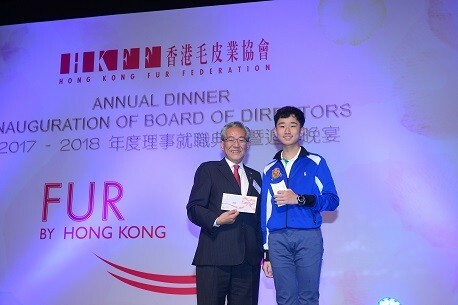 Mr. Wilson Chiu, the Chairman of the Federation, presented his report at the beginning of the dinner and expressed his gratitude for the Board’s unreserved support during his term of service. He was pleased that the Federation had overcome many challenges and accomplished a number of new initiatives, for example, organized lobbying missions to visit governmental departments concerned in Beijing regarding the adjustment of China Processing Trade Policy, established a Fur & Leather Garment Group in Federation of Hong Kong Industries. 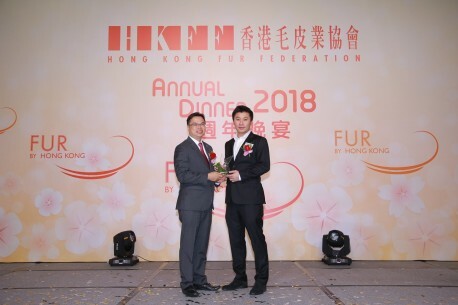 The Federation was also proud to have invited Mr. Gregory So, GBS, JP, Secretary for Commerce and Economic Development to be the guest of Honour of the Hong Kong Fur Gala. Not only Mr. 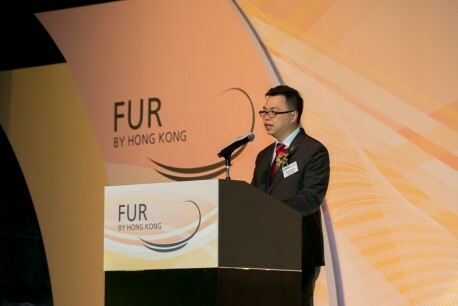 So had acknowledged the industry’s contribution to Hong Kong’s economy in his speech, his presence indeed represented Hong Kong government’s great support to the fur trade. 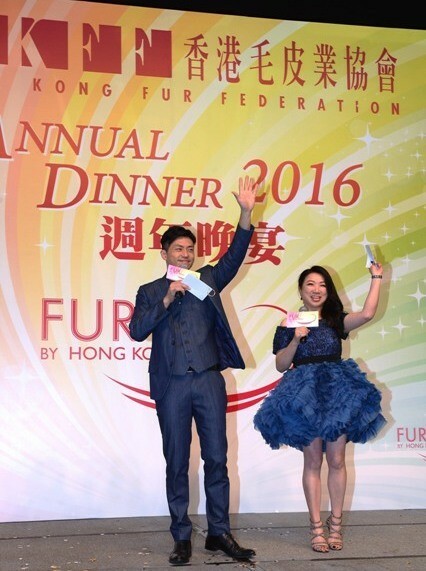 Looking ahead, the “Hong Kong International Fur Fair” will be making its debut in Shenzhen to promote the “Fur by Hong Kong” in this year. 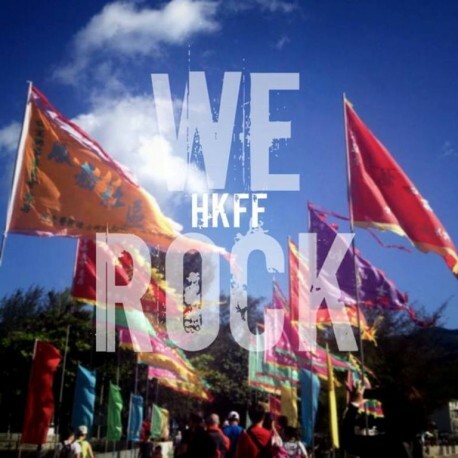 Mr. Chiu trusted the Board will render the same support to the upcoming Chairman Mr. Henry Sun and continue leading the industry to a new height. 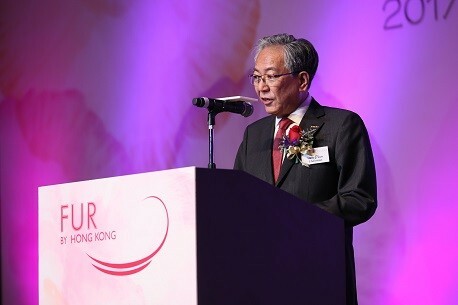 The new Chairman, Mr. Henry Sun, who serves the Chairmanship the second time, presented a speech and highlighted the outstanding solidarity among members, he also encouraged members to face the challenges ahead. 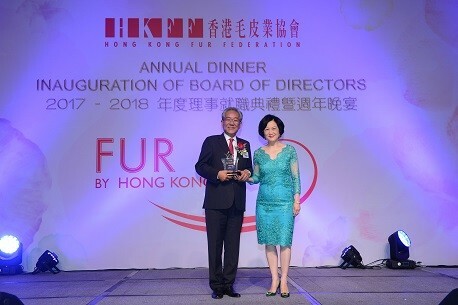 He believed that with the younger generations joining the Board, the Hong Kong fur industry would keep reaching new heights in the years to come. 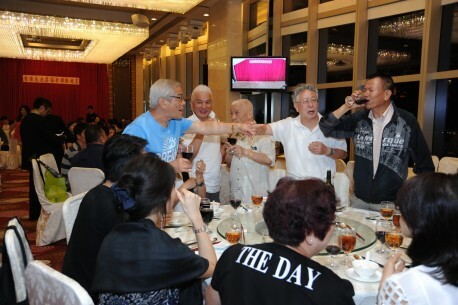 The Annual Dinner has always been one of the most popular activities among members and it has become the best networking platform for the industry. At the cocktail reception, food carts such as pop-corn and cotton candy, game booths and fortune telling booth were set up to entertain the guests of all ages. 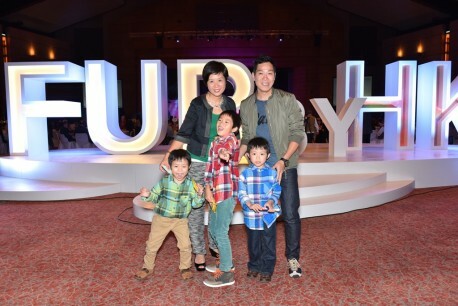 A photo booth was set up to take instant pictures for guests, all pictures were simultaneously uploaded in the “Fur Fun Fun Annual Dinner” Facebook fan page. In addition, the Federation is always keen to contribute to the needy in the society thus the unconsumed food of the event was collected and donated to “Food Angel” to share with the less privileged people. This year, the Federation invited Mr. King Kong, a popular TV anchor to be the MC of the event, joining the games on stage and interacting with the guests. 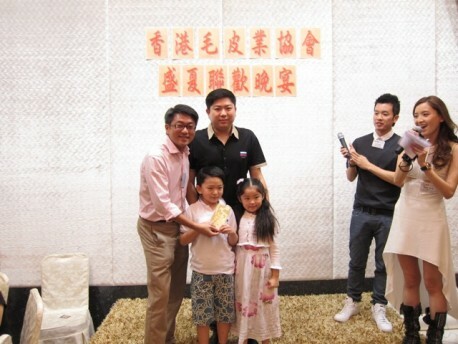 Popular young singer, Ms. Stephanie Ho, was also invited to perform at the event. 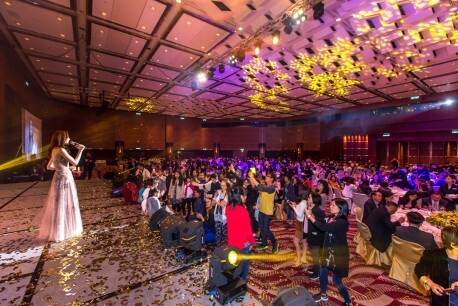 While the best always comes last, apart from Stephanie, the Federation was delighted to invite Ms. Linda Chung, a famous actress and singer to be the performing guest of the finale, guests and fans approached to the stage taking photos during her performance. 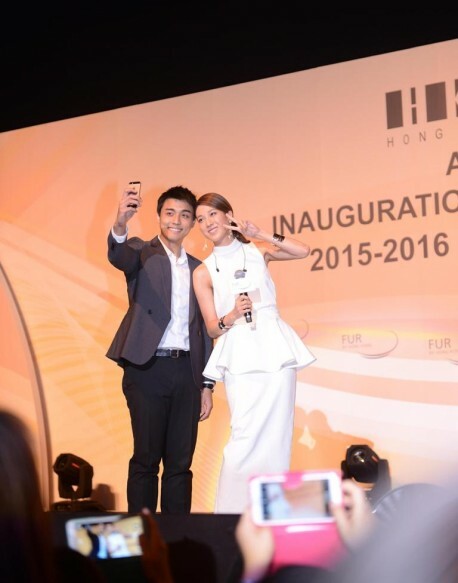 Linda also took selfie with a lucky guest on stage which brought the evening to a climax. 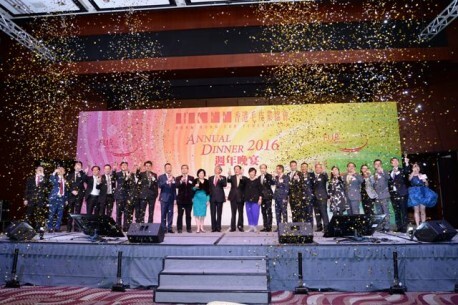 The focal point of the annual dinner was the lucky draws, over HK$120,000 cash prizes were given out during the event. 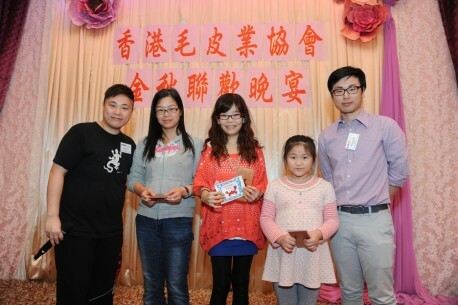 Every lucky winner and attending guest enjoyed a “Fun Fun” gathering! 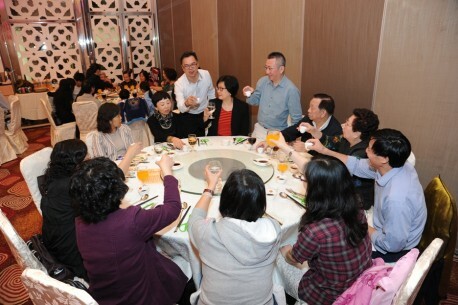 Members enjoyed a delicious Peking Duck & Seafood dinner. Every year, the Young Executive Committee (YEC) of the Federation organizes a number of recreational activities which are well supported by our members. 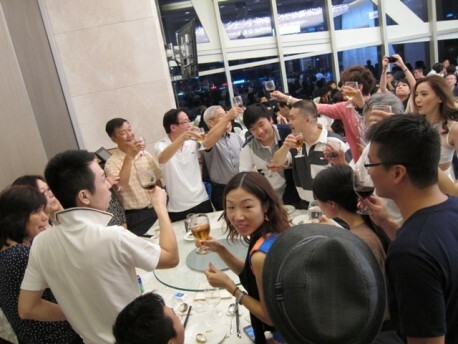 This year, a delicious Peking Duck & Seafood Dinner was held at the East Ocean Seafood Restaurant on 23 August. 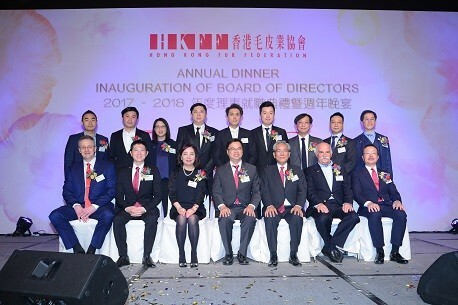 The event attracted over 130 guests from 23 member companies and Young Executive Committee members as well as the Board of Directors including the Chairman and Honorary Chairmen of the Federation. 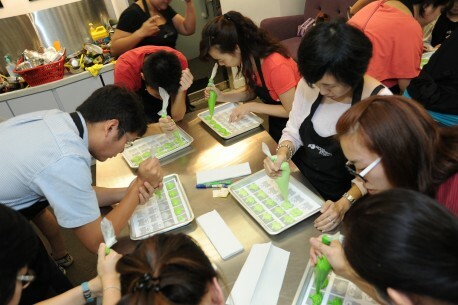 An additional activity ~ “DIY Dessert Making Class” was organized for members in the afternoon. 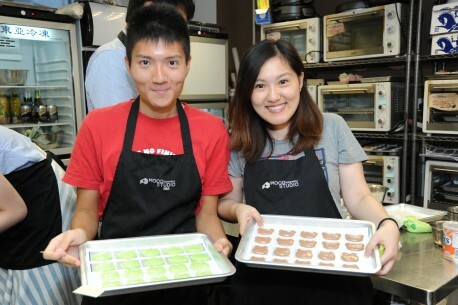 Participants picked their favorite cartoon characters and drew them on the macaroons. The participants are so talented and most of them decorated the macaroons unexpectedly well, the cartoon characters were so adorable. 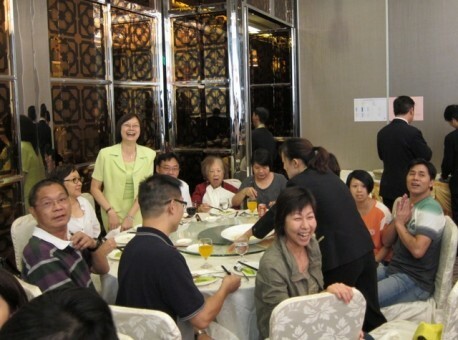 Meanwhile, many members took part in mahjong game in the restaurant. 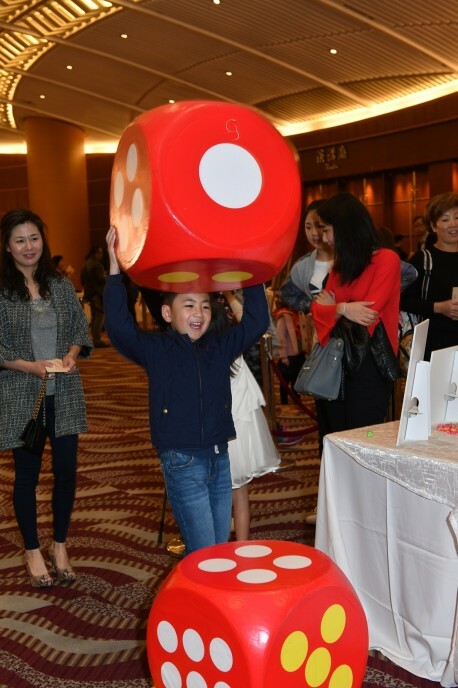 Prior to the dinner, many guests were keen to join an interesting game at the reception ~ “Weight the Macaroon” to vie for the attractive prize, which included a lunch buffet for two sponsored by the Kowloon Shangri-La Hotel and a box of colorful macaroon from Paul Lafayet. 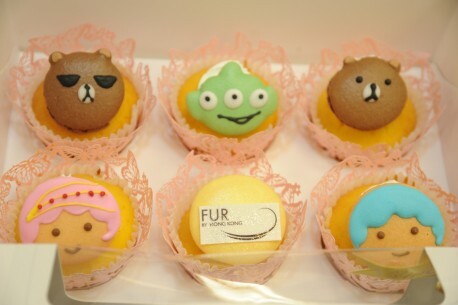 In addition, each lucky winner of table prize received a box of delicious cupcake special ordered for this event, the cupcakes were decorated with colorful cartoon macaroon and “Fur by Hong Kong” logo. Everyone enjoyed the games as well as the delicious Peking Duck and shared wonderful moments with their family and colleagues. 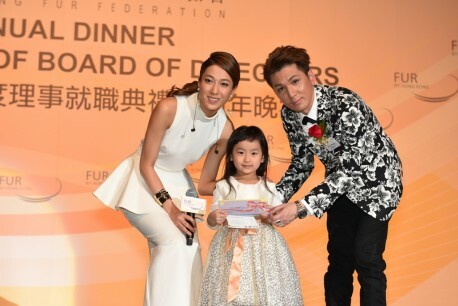 The Hong Kong Fur Federation’s Annual Dinner 2014 was held on 10 March at the Convention Hall of the Hong Kong Convention & Exhibition Centre. 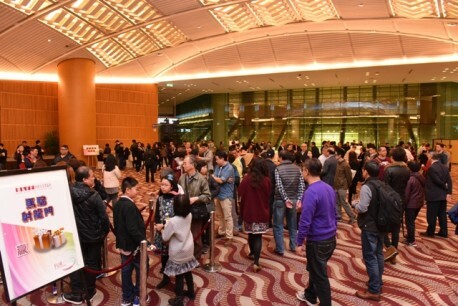 The event was attended by near 1,000 guests, including colleagues and families of member companies. 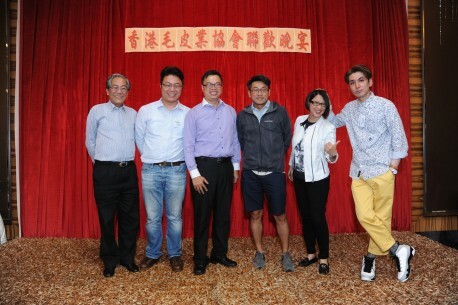 It was with great honor that the Federation had invited Mr. Yang Yi, the Deputy Director-General of EAD, Liaison Office of the Central People’s Government in the Hong Kong S.A.R, to be the guest of honor. In addition, the Hon. Vincent Fang SBS, JP, the Legislative Councilor as well as representatives from Hong Kong’s major trade associations also joined the event, they included: Mr. Eric Yim, the Deputy Chairman of Federation of Hong Kong Industries, Mr. Yuen Mo GBS, JP, the Vice-Chairman of the Chinese General Chamber of Commerce, Mrs. Ngan Ng Yu Ying, Katherine, JP, the Vice President of The Chinese Manufacturers' Association of Hong Kong, Mr. Jimmy Ng, the Vice President of The Chinese Manufacturers' Association of Hong Kong and Mr. Ralph Chow, the Director of Product Promotion of Hong Kong Trade Development Council. 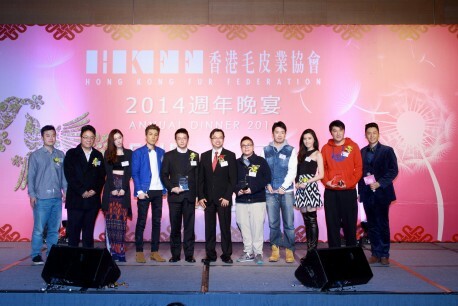 Mr. Wilson Chiu, the Chairman of the Federation, presented his report prior to the banquet. With an objective to cultivate the market in Central Asia, he was pleased that the Board had carried out a mission to Almaty, Kazakhstan last October. 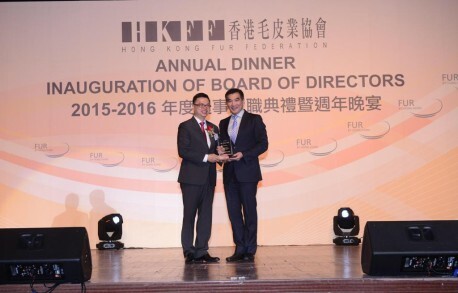 Besides promoting the Hong Kong fur industry, the Mission found great potential in this emerging market. 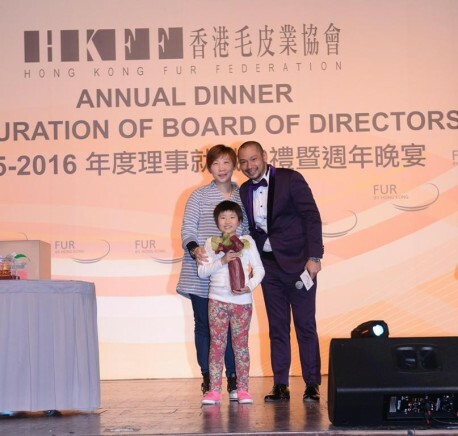 Upon their return, the Board succeeded in inviting and organizing the first ever fur delegation from Kazakhstan to visit the Hong Kong International Fur & Fashion Fair in February and received excellent feedbacks. 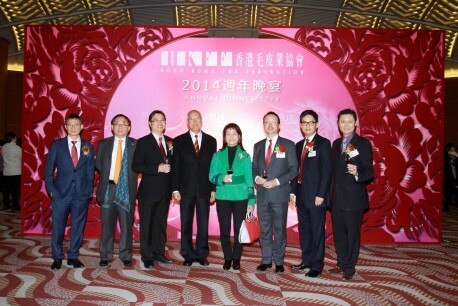 Moreover, the Long-Term Strategic Planning Committee continues striving for the development of the industry. 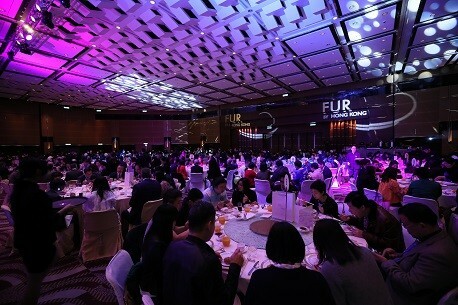 Efforts have been focused on spreading the key messages of the industry as well as promoting “Fur by Hong Kong” to reinforce Hong Kong as the world’s No.1 Fur Trade Centre. 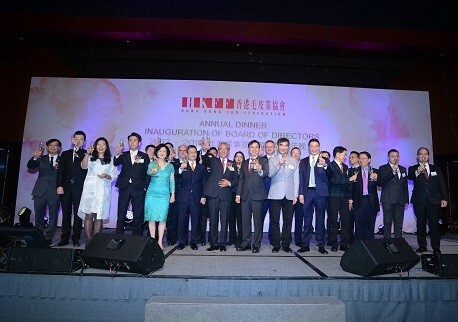 The Annual Dinner has always been one of the most popular activities among members and it has become the best networking platform for the industry. During the occasion, the Federation also took the opportunity to present a souvenir to each of the Young Executive Committee (YEC) members who served the Committee for over 2 years in appreciation of their devoted service and contribution to the Federation. At the cocktail reception, game booths such as silhouette clip art and fortune telling etc were set up to entertain the guests of all ages. During the dinner, two magicians played magic at each table and the guests were amused by the close interaction with the magicians. 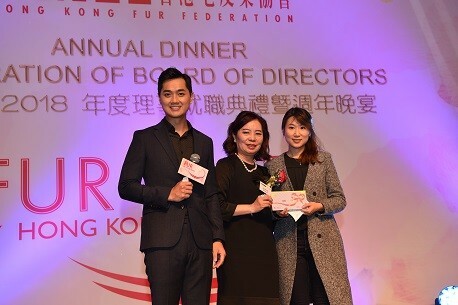 This year, the organizer once again invited Mr. Sammy Leung, a popular artist and TV/radio anchor to be the MC of the event. 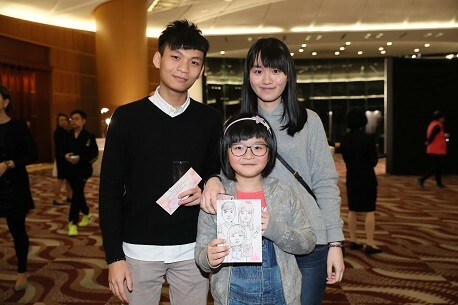 Besides hosting interactive games on stage, he also sang a romantic love song, as well as showing off a few steps of dance with Ms. Brenda Fung, the Federation Manageress, bringing fun and joy to the audience. 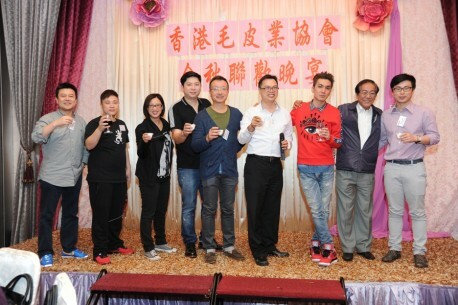 The best always comes last, apart from Sammy, the organizer had specially arranged Mr. Alfred Hui, a young hot singer to be the guest of finale, performing two of his most famous songs. 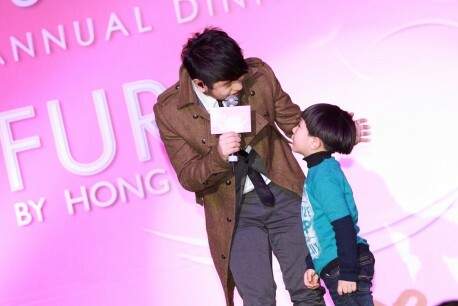 While kids and fans approached to the stage during the performance, Alfred passionately came down the stage and hugged the kids when taking photos which brought the evening to a climax. 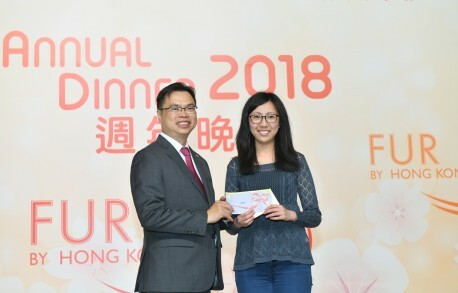 The Annual Dinner would not be complete without lucky draws, over HK$120,000 cash prizes were given out during the event. Everyone enjoyed a remarkable evening and went home with a smile on their faces! Autumn is a great season for enjoying hairy crab. The Young Executive Committee (YEC) of the Federation organized a superb hairy crab cuisine for members on 16 November at East Ocean Seafood Restaurant. 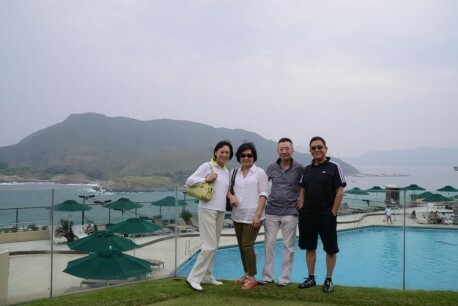 Besides enjoying a sumptuous dinner, members were invited to join a separate activity “Freeing HK” in the afternoon. 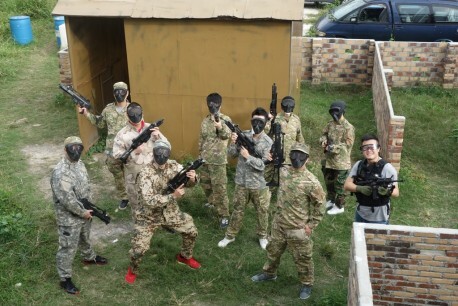 In the afternoon, members joining the “Freeing HK” game were divided into 3 teams entering into 3 game rooms of different themes. All teams tried their best to find the hints to solve the riddle, but none of them successfully escaped from the sophisticated game rooms! 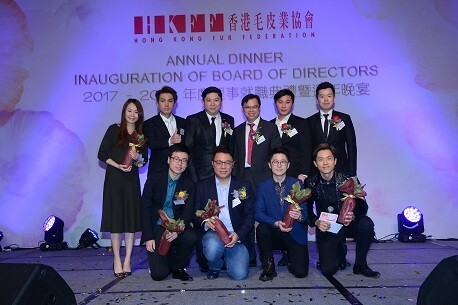 The dinner held in the evening attracted over 130 guests from 25 member companies and the Young Executive Committee members as well as the Board of Directors including the Chairman and Vice-Chairman of the Federation. Before dinner started, some members took part in mahjong game. At the reception prior to the dinner, guests were invited to participate in an interesting game “Guessing the weight difference of two hairy crabs”. 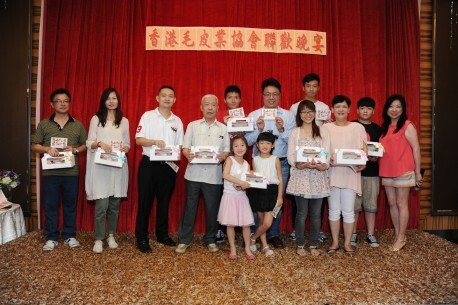 Three winners were awarded a red packet and a bottle of champagne each. During dinner, members of the YEC hosted the game “Assembling the hairy crab”! 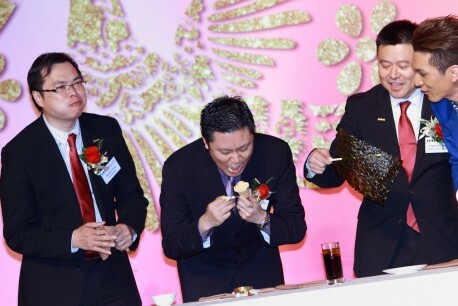 Each participating company was invited to present an assembled hairy crab after consuming it. Three top winners were selected according to the speed and tidiness of assembling the crab, each of them happily received a cash prize. 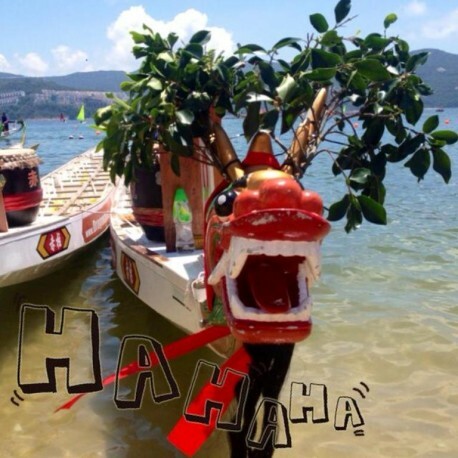 Everyone enjoyed the entertainment games of the evening as well as the delicious hairy crab and shared wonderful moments with their families and colleagues. 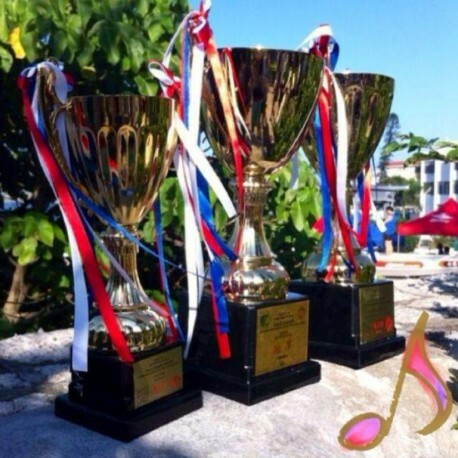 A Sports Day & BBQ Dinner organized by the Young Executive Committee (YEC) was held on 28 September 2013 (Saturday). 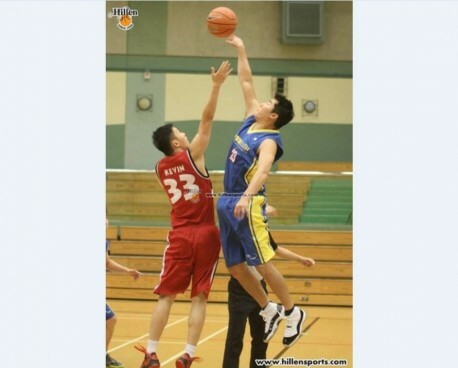 The YEC was keen to encourage members to play more sports through their participation in the above event. 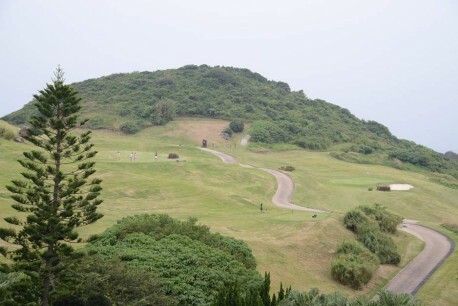 The Clearwater Bay Golf & Country Club has a picturesque sea view and a first class golf course as well as sports facilities. 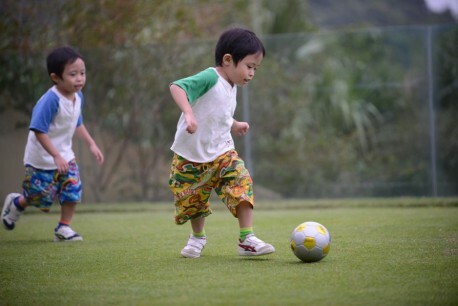 This was in fact the third time which the YEC organized the sports day at the above clubhouse. 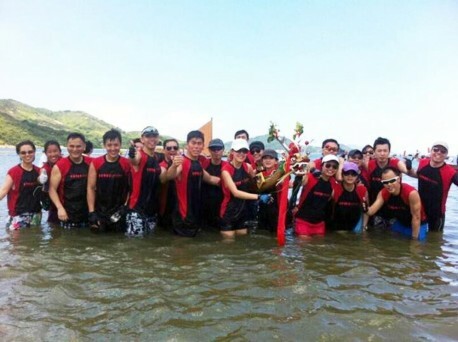 The event was participated by 15 member companies with their staff, family members and friends. All of them were enthusiastic in taking part in various sports games including badminton, table tennis, squash and tennis etc. 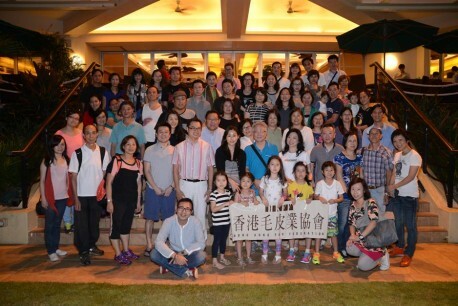 After a few hours of sports, the group enjoyed a delicious seafood barbeque buffet at the clubhouse in the evening. 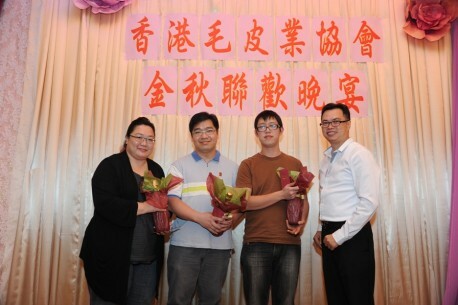 Moreover, a lucky draw was held during dinner, each of the three lucky draw winners received a cash prize! Everyone spent a good time at the clubhouse and enjoyed a wonderful weekend! 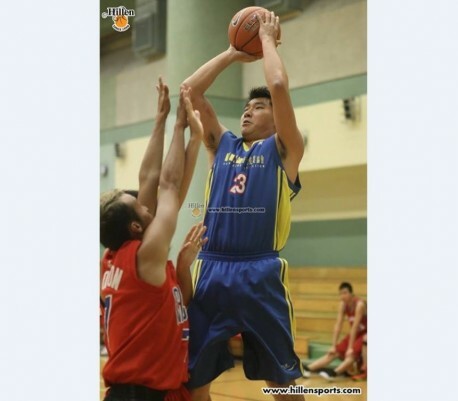 The Young Executive Committee of the Hong Kong Fur Federation (HKFF) has organized a basketball team recently, with an aim to unite young furriers, promote sports and team spirit. 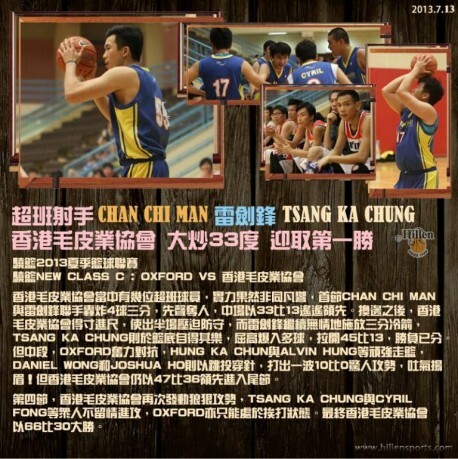 The team, in name of “Hong Kong Fur Federation”, appoints a professional coach to give regular training and strategic advice during each game, targeting to perform its best standard in each match. 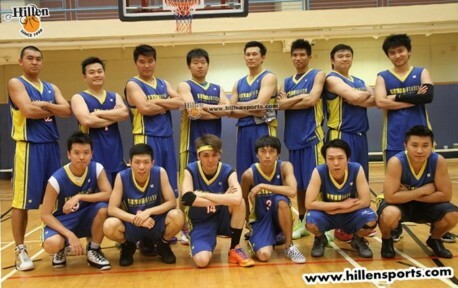 The basketball team is currently participating the Hillen 2013 Summer Basketball League. 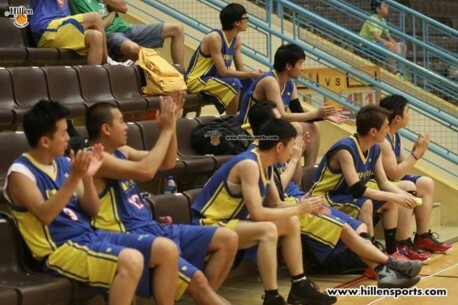 It was most encouraging that the team had skillfully won its first match by 66 points, victory over rival 36 points. 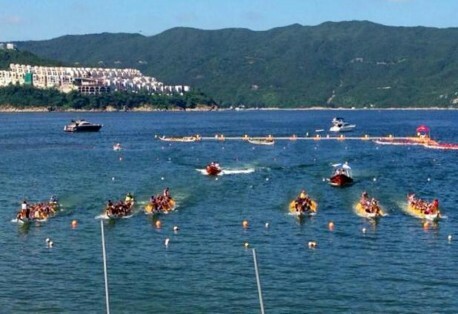 In addition, the HKFF dragon boat team joined the 2013 Sun Life Stanley International Dragon Boat Championships organized by the Stanley Residents Association in June. 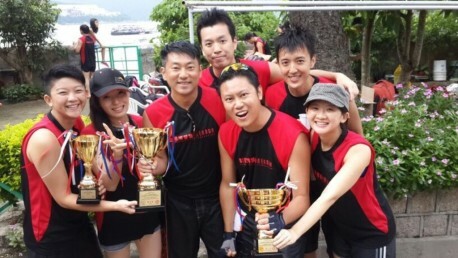 The “Hong Kong Fur Federation Dragons” won 5th Runner-up in the Stanley Plaza Mixed Bronze Cup C Final. 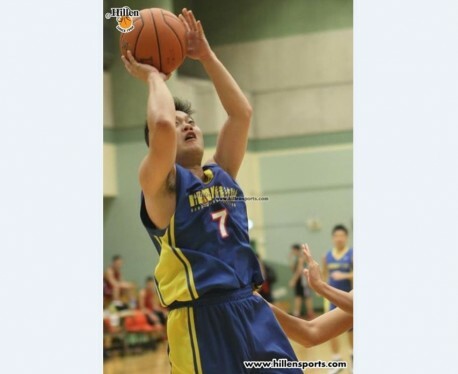 The Federation hopes the above teams could continue improving their skills and gain more honour for HKFF in future games. 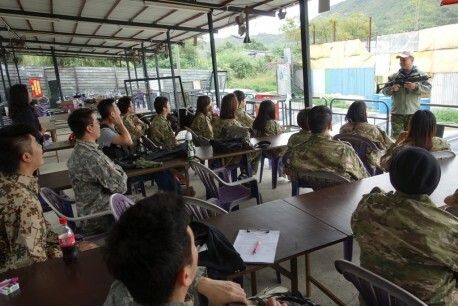 The Yuen Long War Game Activity & Dinner Reception organized by the Young Executive Committee (YEC) on 24 November 2012 (Saturday) was well supported by over 20 member participants. 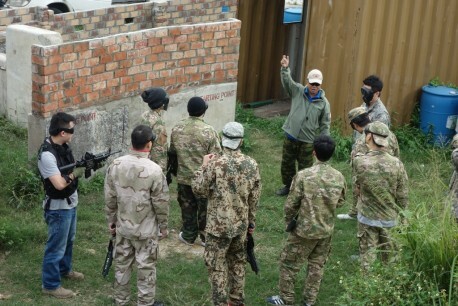 This was the first time for YEC to organize this type of outdoor event and the feedback was great. 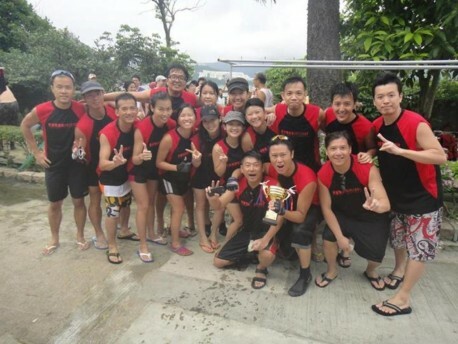 The Chairman of YEC, Mr. Andy Sin stated that it was an excellent activity for members to get together thus enhancing team spirit. 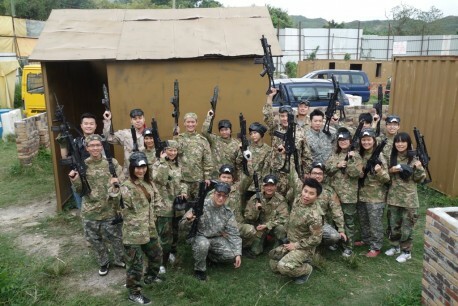 After the exciting games, the participants took group pictures in their costumes and full gear. 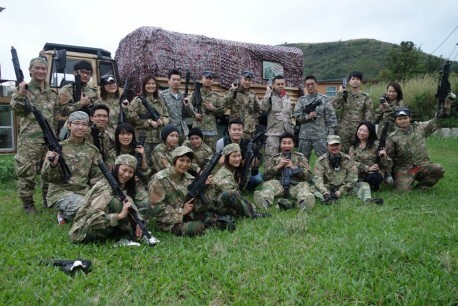 Everyone enjoyed the game so much and were looking forward to another round of war game in the future. 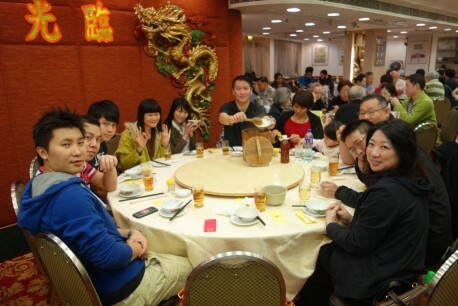 The group then shared a delicious traditional village cuisine at a famous local restaurant in Yuen Long in the evening. Every year, the Young Executive Committee (YEC) of the Federation organizes a number of recreational activities which were well supported by our members. 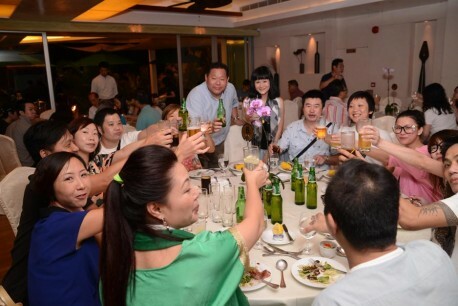 This year, a delicious Peking Duck Dinner was held at the East Ocean Seafood Restaurant on 21 July. 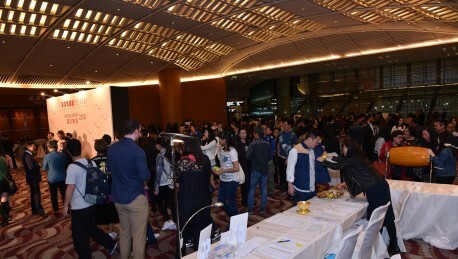 The event attracted over 140 guests from 22 member companies and Young Executive Committee members as well as the Board of Directors including the Chairman and Vice-Chairman of the Federation. 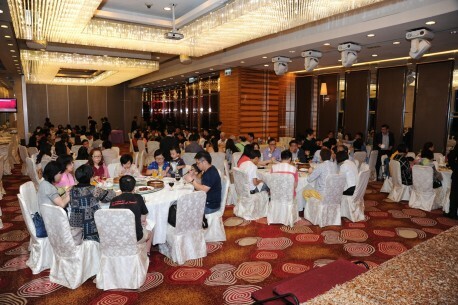 In the afternoon, many members took part in mahjong game – the most popular indoor games in Hong Kong. At the reception prior to the dinner, guests were invited to participate an interesting game “Guessing the weight of long life bun”. During dinner, members of the YEC hosted the game “Draw Something!”. Each table was required to nominate a representative to draw something and guests of the same table would make a guess. The three guests made the fastest guess during this game would become finalists joining the second round. 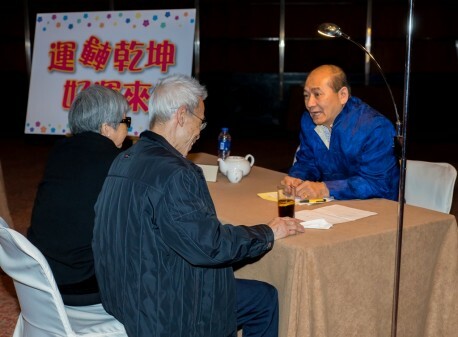 In the final round, Mr. Wallace Wong, the Chairman of the Federation was invited to draw something for the finalists to determine who would be the winner, 1st runner up and 2nd runner up of the game. 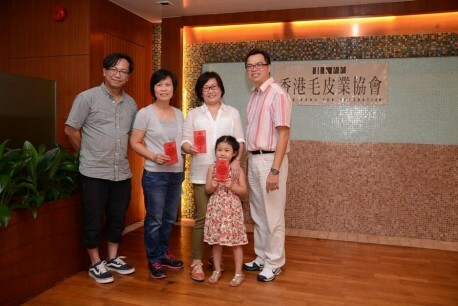 Each of them received a cash prize. 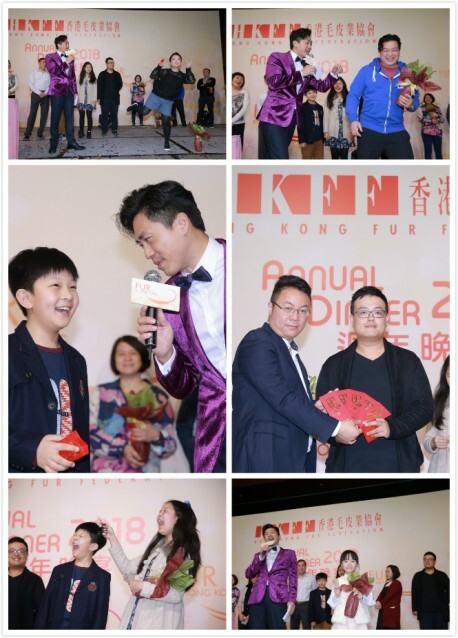 Everyone enjoyed the entertainment games of the evening as well as the delicious Peking Duck and shared wonderful moments with their family and colleagues. 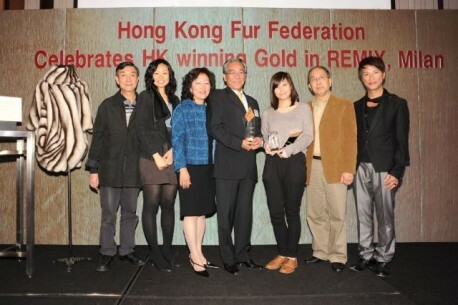 The Hong Kong Fur Federation was thrilled that the Winner of the Hong Kong Fur Design Competition 2011 Sarah Lam Woon Hei shot Gold in REMIX. 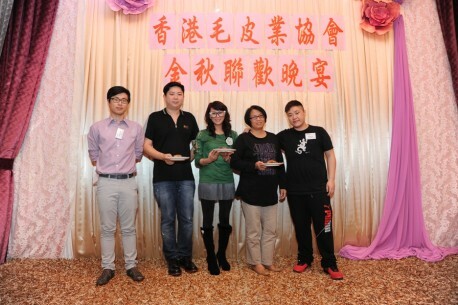 To celebrate this remarkable achievement, a dinner reception was organized on 1 April. 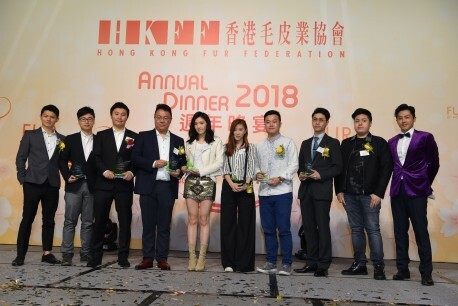 Participating manufacturers, institutes, winning students and sponsors of the Hong Kong Fur Design Competition were invited to share a wonderful evening. 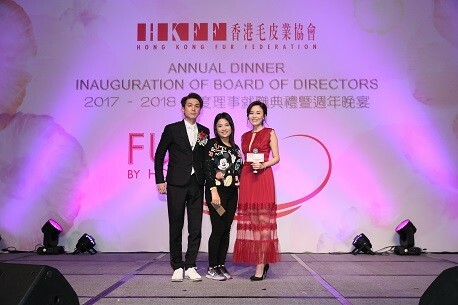 Every year the Hong Kong Fur Federation organizes the Hong Kong Fur Design Competition with an objective to nurture promising local designers. The three top scored winning designs are then submitted to enter the REMIX International Competition held in Milan. We were excited that Hong Kong young designer won the first gold prize in REMIX in 2009 and Sarah shot the same gold prize for Hong Kong again this year. 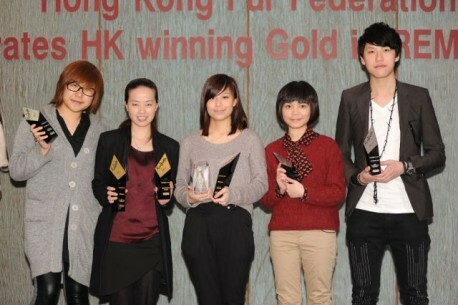 In fact, this year marks the Silver Jubilee of the Hong Kong Fur Design Competition. 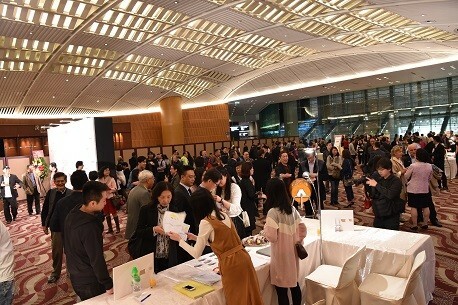 The Organizing Committee was proud that Hong Kong manufacturers’ skillful interpretation and local young designers’ innovative ideas once again received international recognition.